Aqua, Coco-gucoside, Sodium Coco-sulfate, Gyceryl Oleate, Glycerin, *Chamomile Recutita Flower Extract, *Calendula Officinalis Flower Extract, *Aloe Barbadensis Leaf Juice, *Centaurea Cyanus Flower Extract, Anthemis Nobilis Oikl, Limonene, Benyl Alcohol, Sodium Benzoate, Potassium Sorbate, Citric Acid, Sodium Chloride. 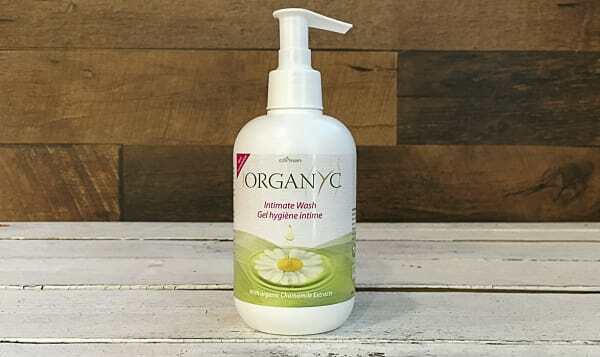 The new Organyc intimate Hygiene Wash with Chamomile will ensure the greatest care for your skin and respect for the environment. It cleanses gently thanks to the natural calming properties of Calendula flowers, while leaving a pleasant scent due to the presence of Chamomile Essential Oil. The formulation also contains Aloe Vera juice and Cornflower, offering excellent cooling properties. This product traveled 8525 km to reach our warehouse.